Did I tell you I was a beet prodigy? Well, apparently it’s true. Either that or just about any dunderhead can grow beets which is probably more true. A while ago I showed you the start of my garden, and it was promising. I did very well at starting seeds and had an exciting variety underway. But the next step? Transplanting; that’s where I hit my snag. I diligently made all my own little pots from recycled newspaper, transplanted my seedlings and proceeded to watch about half of them wither and die. But, I’ve rebounded. My zucchini harvest is wearing me out, my tomatoes are promising, as are the cantaloupes and brussels sprouts. The pumpkins are going crazy and the fodder beets are plodding along. I’ve added rows of late beans, pickling cucumbers, swiss chard and turnips as well as some cilantro, fennel and basil. But the one crop I don’t ever seem to screw up? Beets. I’m a latecomer to beet love. 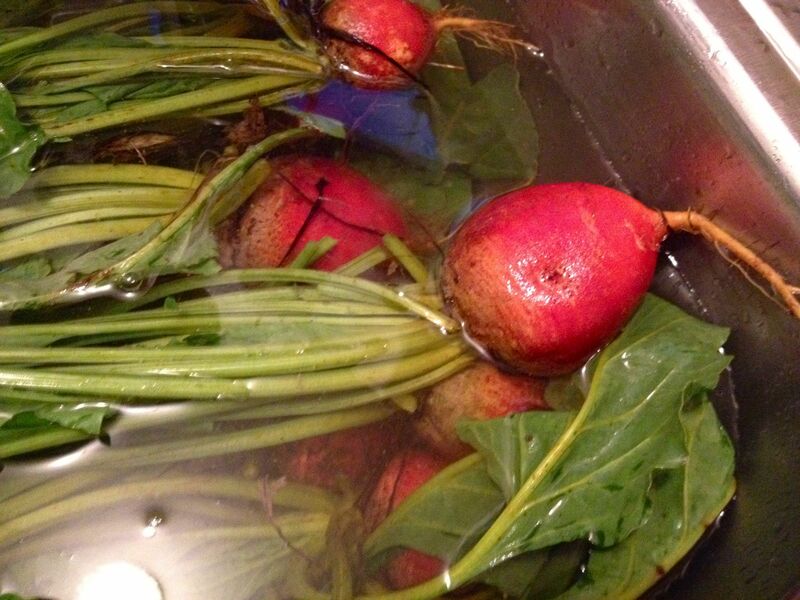 I had never had a fresh-from-the-garden beet or one without vinegar, sugar or a Harvard education. All of which I really hate. To me, the taste of a canned beet is exactly what it tastes like when I’m swimming and snort water up my nose. Decidedly unpleasant. 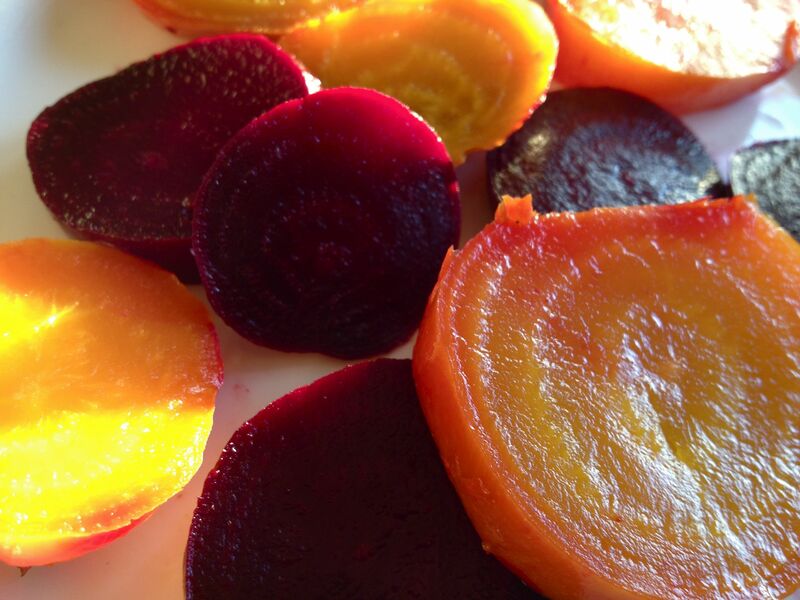 So, my first real still-warm-from-the-garden beets were a real delight for me. I truly had no idea how deliciously enjoyable a beet could be. And, the revelation that beets could be simply roasted, slipped of their skins and served with nothing but good butter and salt, well that’s changed everything. Consider me a raving fan. This year, I am very excited that my seeds are all heirlooms, organic and not one cent of my money went to Monsanto. I decided to branch out and try two kinds of beets: Boro, a traditional red variety, and Touchstone Gold, a golden beet. The Boros are mildly flavored and delicious, and the Touchstone Golds are the most beautiful, luminous color I can imagine. Even caked with dirt they shimmer and glow – truly breathtaking. Having no human babies of my own, I can’t help but chuckle over new parents’ universal compulsion to share baby photos. And now as a new-ish gardener, the urge to share veggie photos is nearly as powerful. Funny… but the wonder of both just never gets old. I decided to harvest half of my beets the other day and, since the tops are even more nutritious than the roots, I made sure to carefully preserve both. The Touchstone Gold greens are especially tasty and mild and were surprisingly tender. Even if the beets themselves weren’t sweet and tasty – which they are, and not such a treat for the eyes – which I totally enjoyed, I’d still grow them just for the greens. Very good both raw and steamed. Okay, Touchstone Gold commercial over, what am I going to do with all those beets and greens? I see all you preservers jumping through hoops with five spice this, multiple combinations and off the charts degree of difficulty projects. And, while I admire it with all my heart, that’s just not what gets eaten around here. And, I like to cook, so I like to keep my options open. Unflavored stuff gives me the freedom to follow my seasoning fancy when it’s time to put it on the plate. My beets are roasted – simply washed, tossed in a bit of olive oil, covered with foil and put in a 375˚ F oven until they’re done. I had a little variety in my beet sizes, so the smaller ones came out after about 30 minutes, and the bigger ones at around 50 minutes. I left them in a bowl covered with foil on the counter overnight, and in the morning with a little squeeze they squirted right out of their skins. I sliced them, measured them into two-serving portions and put them in zip-lock freezer bags. 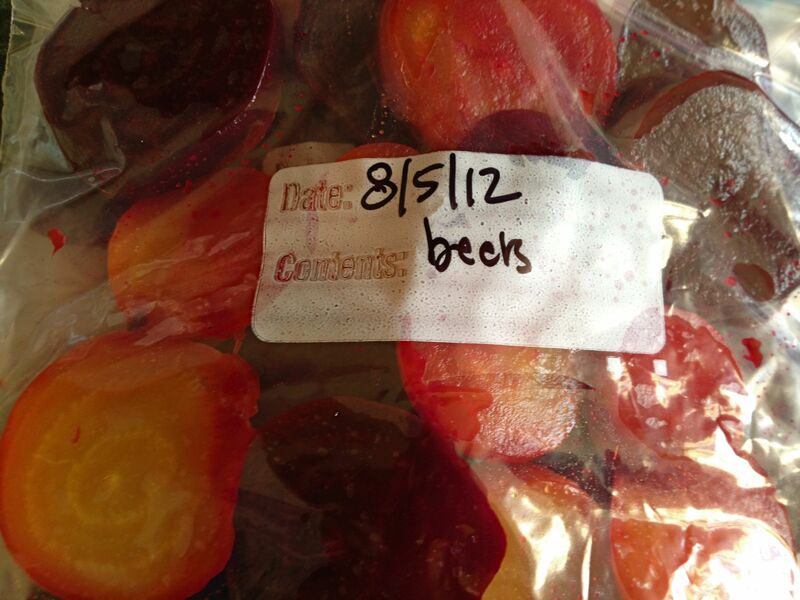 Be sure to lay them flat, squeeze out all the air before sealing and label each bag before putting in the freezer. Now all winter I’ll have an easy side ready to go – just defrost, nuke, top with a pat of butter, some olive oil, tangy cheese or use in your favorite beet recipe. You’ll never notice it’s fresh from the freezer instead of straight from the garden. But the tops?? What to do with them? My harvest wasn’t a huge one, just a manageable one. I ended up with a little over 2 pounds of greens. I want to love beet greens, but they do wear a little thin for me. To the rescue: a nearly forgotten recipe from one of my most used cookbooks, Cucina and Famiglia – a charming book with reminiscences from two Italian families and is a companion to Stanley Tucci’s jewel of a film, A Big Night. So now, I’ve got some pretty summer beets waiting to cheer me up some future chilly day and a lovely torta salata (that’s pie to me) made with my fresh, tender, organic beet greens, home-grown onion, freshly grated Gruyère and bacon for dinner tonight. I love the crust on this pie. 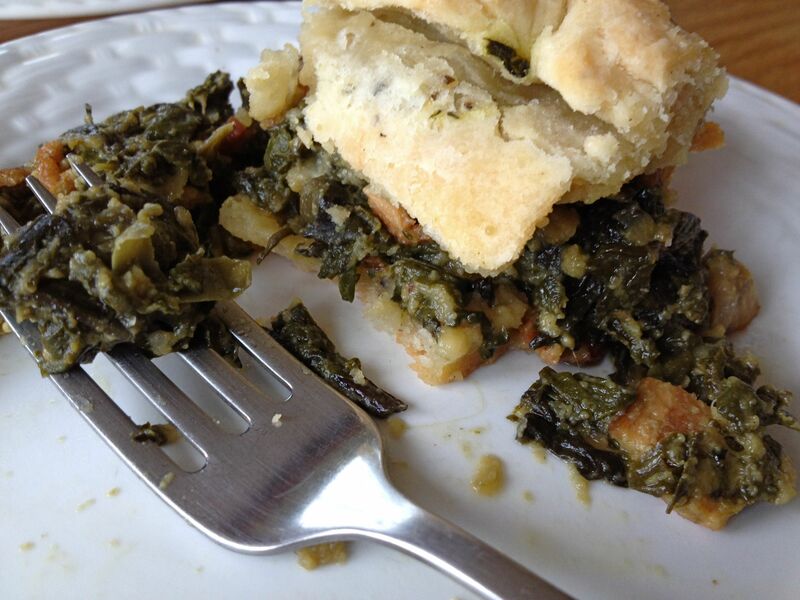 It’s an interesting recipe – very wet & sticky to work with, but adds a buttery, peppery white-wine-y accent perfect for a savory meat or veggie stuffed pie. 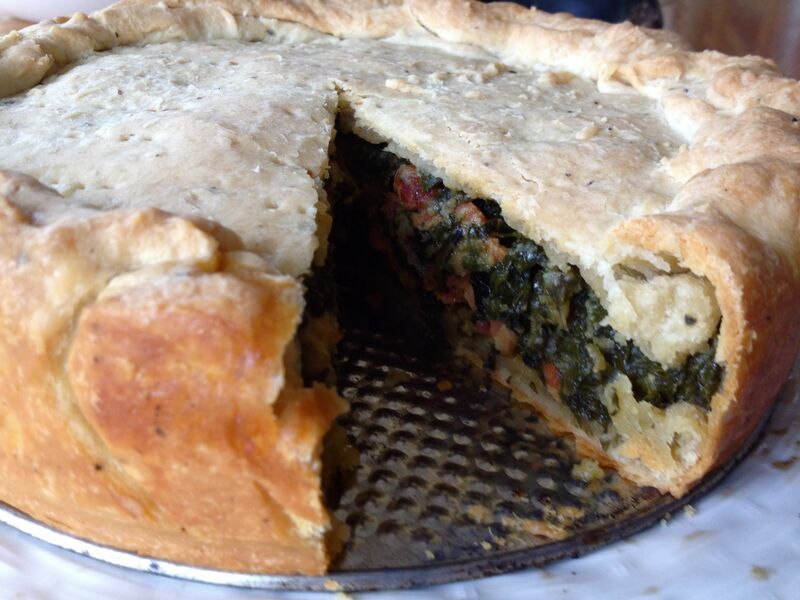 I baked this pie in a 10-inch Springform pan – it is a tall pie. 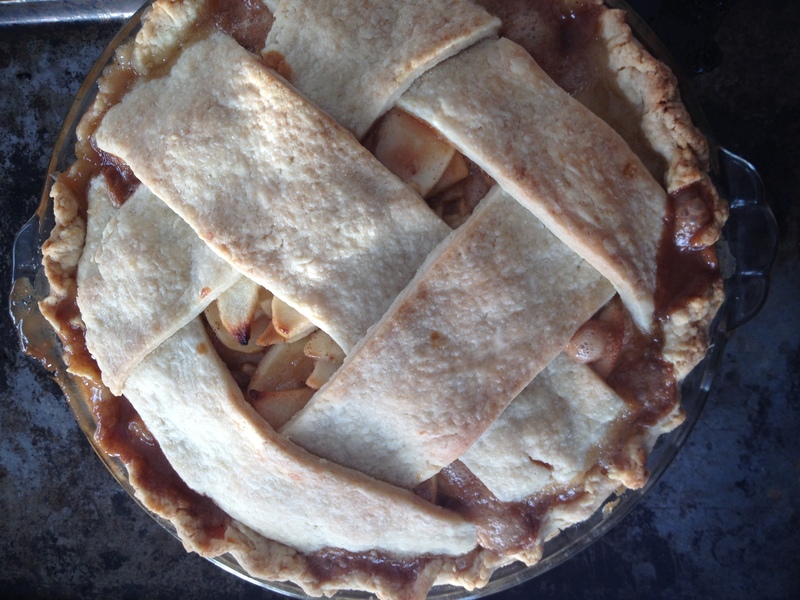 If you use a regular pie pan you may need to divide the recipe. Click here for the printable recipe. Another option is to bake in a 9 x 15” baking sheet with a 1-inch rim, cut into small cubes and serve either hot or room temperature as an appetizer. I’ve done this several times and it’s always a hit, even with those who don’t much like greens. Okay friends, surprise me. What have you done with your greens? OK. You’ve sold me. I’m willing to give them a try. Jackie, if you make the torta in a 9×13″ pan, will it also have a crust on top? This looks so good and I have a friend who has lots of beets and tons of Swiss chard that they don’t know what to do with. I really can’t wait until my new house kitchen is done so I can do some serious cooking! Yes It’s like a big flat two crust pie. 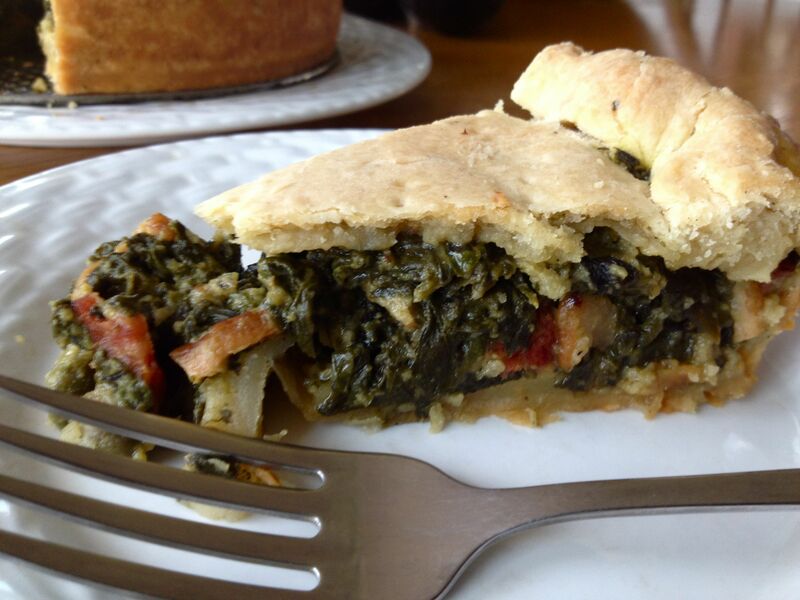 The ratio of crust to filling is more pleasing for people who don’t like greens. Wow! I haven’t done that! But I want to now. 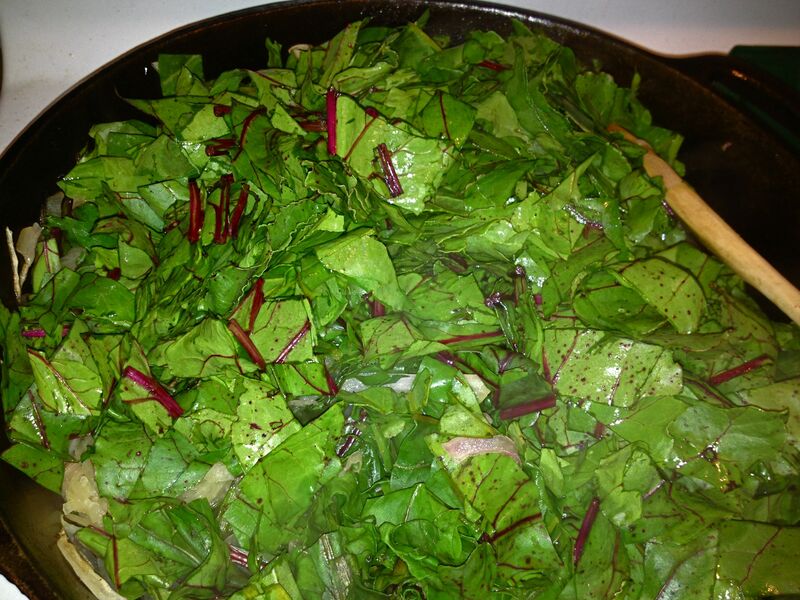 I can get the kids to eat pounds of greens if I saute with garlic and mix with pasta. Pasta does make everything better. I suspect you’re a more valorous veggie eater than I am. Try the variations at the end of the recipe too. The mushroom potato and the onion cheese are pretty inspiring too. Have you tried making the Beetroot Relish from Pam Corbin’s book? It’s very good.